Benjamin was born in Budapest (Hungary). He obtained his BSc degree at the Budapest University of Technology and Economics in Mechanical Engineering (in the department of Polymer science and technology). He continued with his MSc education in the department of Mechanical Engineering (in the Micro- and Nanotechnology track) at the Eindhoven University of Technology supervised by Prof. Jaap den Toonder. He completed both his internship and graduation project at Solliance Solar Research under the supervision of dr. Yulia Galan and dr. Francesco Di Giacomo. His internship was an organic solar cells related project which then was continued with a graduation project focusing on the roll-to-roll compatible processing of TiO2 as the electron transport layer for perovskite solar cells. 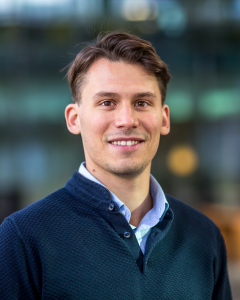 After finishing his MSc studies he joined the M2N group as a PhD candidate under the supervision of Prof. Rene Janssen and dr. Martijn Wienk. His project involves the development of perovskite solar cell architectures for special substrates and the development of novel lead-free perovskite formulations.